We’ll use hotel’s free transfer to Vatican City for going there, where we’ll spend the entire day exploring the architecture and art in there. We’re at 9 AM in hotel desk with our fast broken and ready to take the hotel’s van making the transfer to Vatican City. A family with a girl is coming with us. When I ask to our driver about the point for the return trip he answers me it is in Cavour Square, which we know because yesterday we were there. The van leaves us in the wall bordering the smallest state in the world and, as we’re going down to St. Peter’s Square, the family is taking the opposite way following the sign pointing to Vatican Museums. I didn’t know their entrance was in the outside. We pass security checks and get St. Peter’s Square by 9:45 AM. 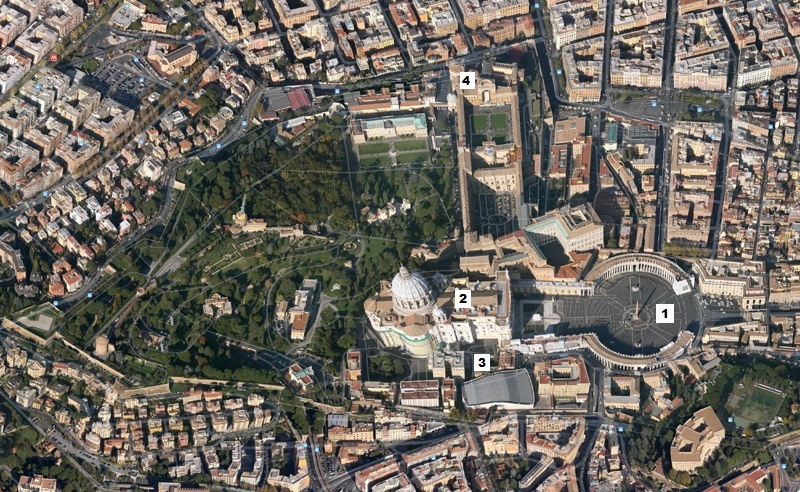 Its circled part is huge, bordered by Bernini’s colonnade, from which we’re coming in. The rectangular part between the circle and the basilica is fenced as it is all set with chairs for an event, which we guess will have something to do with Christmas. I’m using the big and nice tree in the middle of the square, beside the obelisk, as a hint. 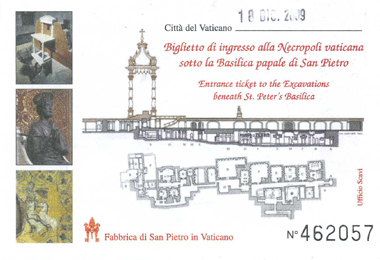 We can see different entrances for the basilica, with short lines for each of them, we choose one which finally takes us to a hallway in basilica’s lateral where the Popes tombs are exposed, one after the other. There are some signs forbidding the use of cameras but, as everybody here is using them, we do it too. The crowded tomb results to be John Paul II’s. When we’ve completed the itinerary for the tombs we finally get into the magnificent basilica. St. Peter’s baldachin is taking a relevant role in the middle of it but looking at any other side one realizes is in an art museum: the walls of the building are full of monuments for old Popes and religious motifs. The most of them are sculptures made in marble, as famous Michelangelo’s “Pietà”. We explore all basilica’s corners, full of treasures, until 10 minutes to 11 AM. AT 11:15 AM we have scheduled a tour for necropolis and St. Peter tomb excavations and the email states we must be at Excavations Office 10 minutes before. Before leaving, we stop to observe a big box ready for being set to display when the clothes covering it will be removed. We manage to see the contents, which results to be the biggest nativity scene I’ve ever seen. A sign says it will be displayed on December 24th. Once outside, we ask to a Swiss guard for the Excavations office but he doesn’t know what I’m talking about, so we follow that side of the basilica looking for someone else to ask. Instead, we find a door with the sign “Ufficio Scavi” besides. I identify the word “scavi” from the email they’ve sent to me and, yes, it is where we were looking for. Today is our lucky day! We’ve got a couple of tickets like the one above in exchange of the 10€ per person we knew we should pay for this tour. At 11:15 AM a guide comes and takes the small group we’re part of with her to some stairs going down to the dark from somewhere in the basilica. Down, we’re in a lower level and also lower temperature. It is an entire city down there! Taking photos or videos is not allowed, so I take this quick one from one of the courtyards in the necropolis when everybody was out of there. There are streets with bricked walls and floor. It could be us walking by the streets of an ancient city out there by night if we could not see the ceiling, which is eating the top of most of the walls. This visit is very interesting and is entirely happening beneath basilica’s ground. I’ve even manage to see the baldachin through an air vent in the ceiling in our way to St. Peter’s tomb. Actually, the tomb is under it. It is a beautiful room we already saw between the Pope’s tombs, but now we’re going to see what is behind what is shown as tomb for the first Pope in history. In an area protected with glasses we can see excavations in the soil, part of a human jaw and another bone identified as belonged to this historical figure, based in some tests and graffiti carved roughly in the place. We go up to a narrow pass way full of statues which is driving us to the Popes tombs itinerary, where our guide leaves us, finishing this tour in less than one hour. We complete the route again to go outside. We leave Vatican City to go back to Rome, but following the wall and the same way the family of this morning and soon we reach the entrance to Vatican Museums. We can see a small nativity scene here too. We get our tickets after paying 14€ each for them. We can see why this place is called “museums” as actually there are a lot of them here. There is a museum of coins, stamps, maps, carriages, archeological Egyptian, archaeological Etruscan, sacred art, a Picture Gallery, etc… and all this besides the halls and rooms where we can find the Rooms of Raphael or the Sistine Chapel. No stress. We just follow the way to the rooms which make us going through long halls full of sculptures or ancient artifacts. We pass through one hall full of tapestries and carpets, another full of big painted maps. The ceiling of this palace are covered with beautiful paintings too. When we’re done with the long halls we start going room after room, all full of wall paintings and statues. When we come into the Raphael Rooms I spare some time to admire the “School of Athens” for a while. I didn’t know it was that big. It is just a few minutes later when we find ourselves inside Sistine Chapel. The room is filled with pews to seat and look around. It is not looking as a chapel at all, but a common rectangular room with a very high ceiling and flat walls. There is nothing special on it but for the colorful paintings covering every inch of walls and ceiling. And this is a big BUT here, and a lot of beautiful painting also. So much that I feel like one could spend the entire day here and still skip a lot of the details Michelangelo put in here. It is a pity photos and videos are not allowed precisely on this room. There are even some guards looking after avoiding every attempt of a tourist for getting an image from here. That’s the reason the quality of the video I manage to take should be better, but it is the unique sample of this wonder I could bring. With the famous chapel the itinerary ends and we reach a common area with accesses to the different museums. There is also a buffet restaurant and toilets. We use both of them. The food and drinks taken are 7€ and 9€, so we both can lunch here by 16€. We can rest here too. We’ve preferred to be inside, but it seems the most popular option is taking some place outside, in the gardens. From all the rest of museums we spend the afternoon first in the archeological ones, watching Egyptian mummies and statues of gods, and then the big Etruscan sculptures. I’m surprised by the collection of stone bathtubs. We finish our visit with the Picture Gallery, tired, and take the way to the exit around 5 PM. We leave the place through he beautiful spiral staircase by Giuseppe Momo. We walk by Roman streets to North, where we know “Ottaviano” metro station is, as we already used it yesterday. In our way, we do some shopping and take chocolate with pastries. It’s past 8 PMK when we reach the hotel with our bodies claiming for a well-deserved rest.